Before we even moved, Mom was researching the sewing scene in Michigan. And discovered that there was a Big. Exciting. Sewing. Show. In the Detroit area (about 2 hours from here). In September. She floated the idea of coming up and driving over together. I'll admit, I was initially doubtful. We were supposed to be moving in! And getting ready for the baby! But it wasn't too long before I realized that a couple of days of help around the house would more than make up for the lost time. Besides, I was already sick of moving in. So we laid our plans and hatched our schemes. But here's the thing about sewing shows. People there sew (I know, I know. But I'm going somewhere with this). Which means they really appreciate the things that you've sewn. Meaning it's super-awesome to wear something you've made. I made a dress to wear to my sister's rehearsal dinner (ack! Gotta take a picture of that and post about it before the baby belly disappears), but it was a little formal for this. And other than that, my maternity sewing has been limited to a couple of imitation Belly Bands. Which are a rectangle of fabric, one seam, and spectacularly unimpressive. So I needed something else. 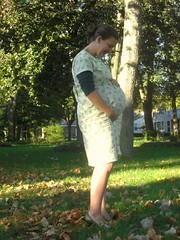 And this dress has been on the back burner almost since I knew I was pregnant. It was supposed to get made in time to take to Europe, but that was a no-go. In retrospect, it wrinkles too much for it to have been a very good travel dress anyway. So, the week before Mom got here to whisk me off to Novi, I sat down and actually cut the dress out. And then I realized that I couldn't find my thread! So it was assembled using thread on my stash of bobbins. And then it languished. Right before Mom arrived, I went to the store and actually bought some more thread, but then she and I got super busy washing shelves, moving things, etc. and the sleeves and hem weren't actually done until the day we left for the show!